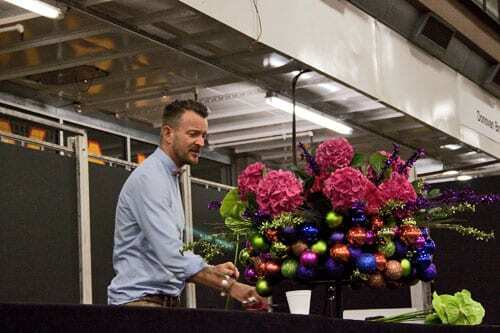 Last Wednesday, I attended an amazing Christmas Preview event at New Covent Garden Flower Market in London. 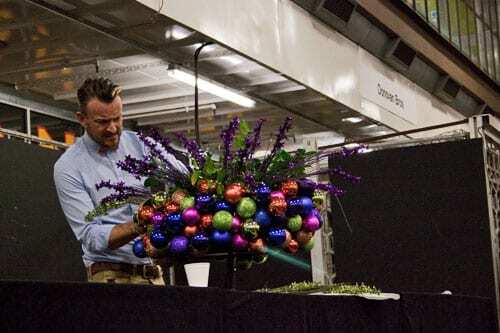 There were four wonderful floristry demonstrations and I’ll be featuring one a week during this month. First off is the fabulous Simon Lycett. 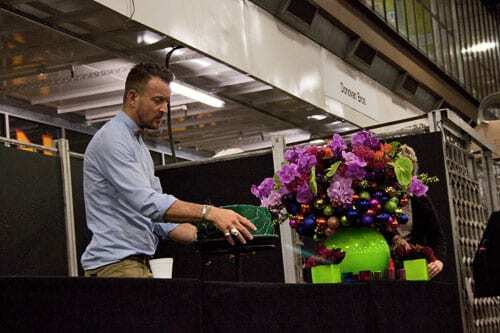 I love his lavish and elaborate designs and the two he created last week certainly had real ‘wow’ factors, as you can see from the extremely colourful and sparkly arrangement above! 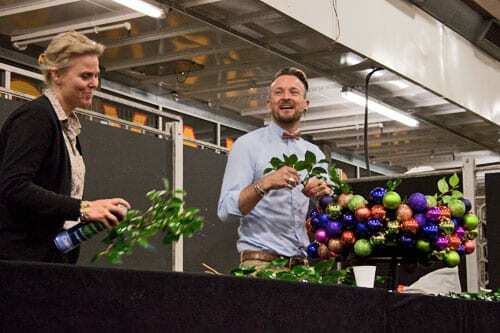 Simon started creating the arrangement with two unsoaked wreath frames which he had secured together with sticks. He then attached an assortment of matt and sparkly festive baubles from C. Best to the outside of the frames with stub wires. Using black reindeer moss, he filled in the gaps between the baubles. He mentioned that as the baubles were plastic, they have a tendency to sometimes come off their hangers, so it’s advisable to glue them on. And he also said that for a more natural effect, instead of baubles, you could use apples or satsumas. 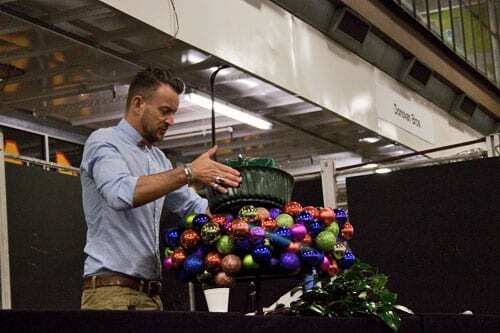 Once he’d created the gorgeous container for his design, he then took some soaked foam in a bowl covered with chicken wire and placed it in the centre of the two wreath frames. Then he inserted camellia foliage from GB Foliage into the foam, firstly cutting and then splitting the stems. Throughout the demo, he was assisted by the lovely Lisken and here she is adding a touch of lustre to the foliage with leaf shine. 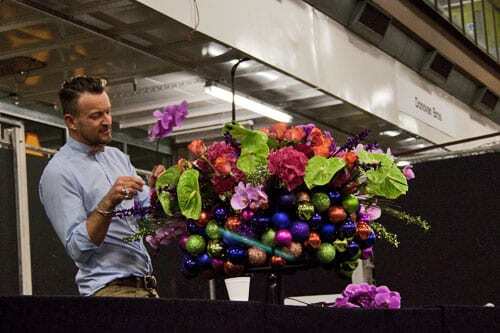 Simon then added long sparkly tinsel decorations in purple and lime green to add some movement to the design. Next, he added amaryllis by firstly making a guide hole in the floral foam with his thumb. To add a kick of colour and some softness to the design, he added pink hydrangeas. 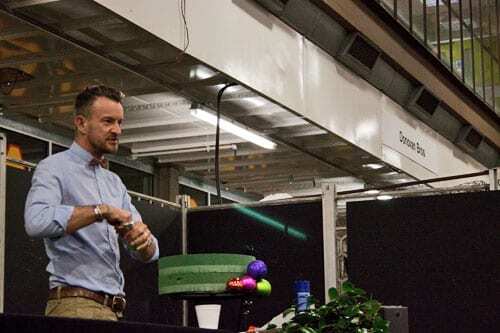 Throughout the demo, Simon dropped in lots of tips. With hydrangeas, he recommends that you leave them for 2-3 days in water to let them have a good drink before using them, as he said that they’ll last that much longer. 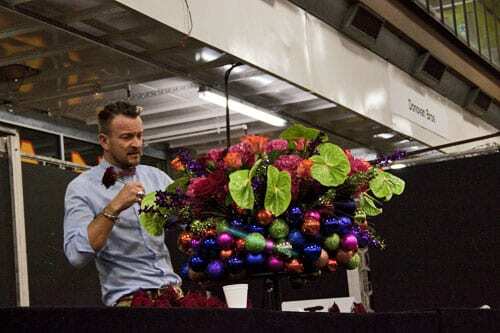 Then, to add a contrast in colour and texture, he added lime green, glossy anthuriums. Roses, including Grand Prix red roses, were added to the design in clusters to give them impact. Two different varieties of beautiful pink phalaenopsis orchids were inserted to add a touch of glamour, together with sparkly purple polystyrene balls mounted on canes. Simon suggested that you could alternatively use mirror balls. 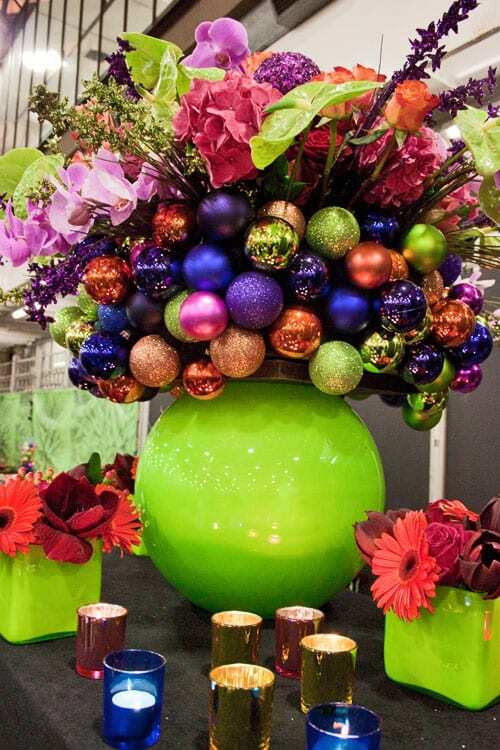 To show how the design would be dressed for an event, the whole arrangement was then placed on top of a vibrant lime green vase. And coloured tea lights were dotted around its base, together with cubes of complementary blooms. I’m sure you’ll agree from the first image in today’s post, that it’s a very eye-catching arrangement, perfect for a Christmas party! It was then on to Simon’s second amazing design, this time with a white and cream colour scheme, which you can see below. He started off with some soaked floral foam and chicken wire secured to a plastic dish. 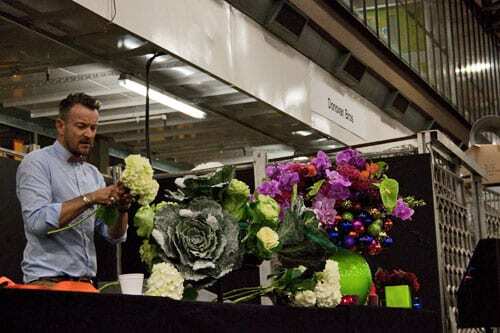 Over-sized artificial sparkly cabbages from C. Best were then inserted, together with some real ‘cabbages’, also known as brassica, and white hydrangeas. 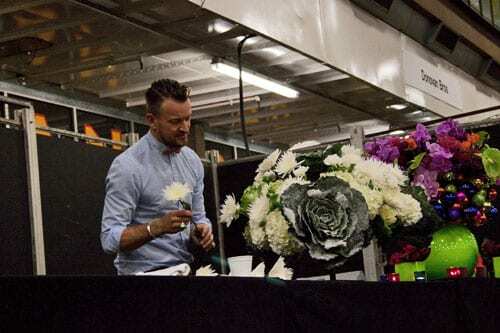 White carnations from Bloomfield were added in clusters, together with white spider chrysanthemums. Then beautifully scented creamy-white Norma Jean roses were added in groups and finally, stems of white phalaenopsis orchids. Little did we know that this arrangement was simply the base of Simon’s design! He mentioned that a lot of his work is for big-scale events, parties and weddings, and it’s very important to him how he presents and dresses the designs. 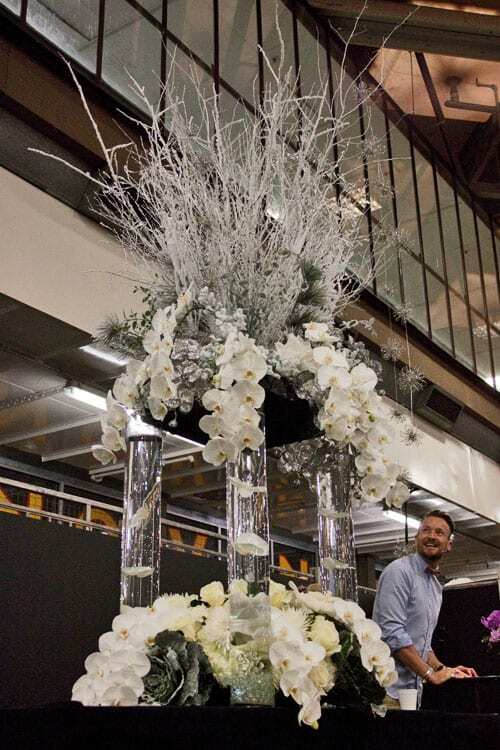 So, he placed four glass vases filled with water, phalaenopsis heads and crystals around the design, topped them with a back perspex tray and added an amazing ‘winter wonderland’ arrangement which he’d made earlier. 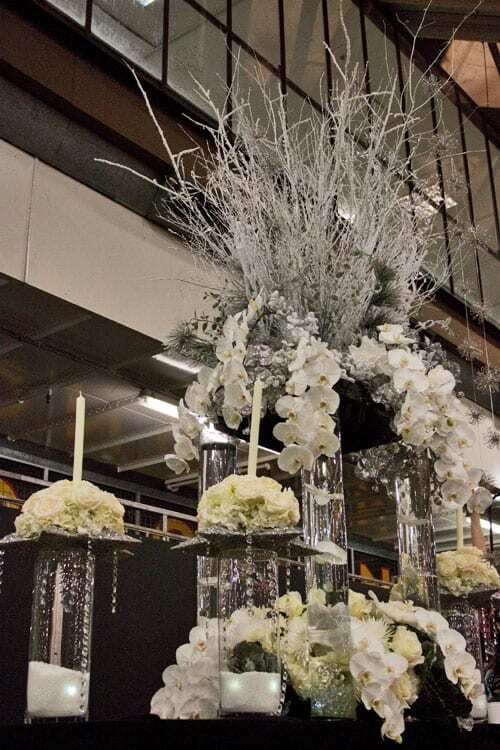 Then vases filled with fake snow and led lights were added, with glittery stars and complementary floral arrangements on top, as you can see in the first image of this design. Simon certainly knows how to entertain his audience and there were lots of gasps and ‘oohs’ throughout his demonstration! I hope you’ve enjoyed seeing his wonderful designs and reading the notes on how he created him. If you get the chance, I’d highly recommend that you try and see him in action. You can check his whereabouts on the ‘Out & About’ section on his website. Soon, I’ll be featuring a Q&A with the man himself, as I interviewed him last Wednesday too…at 7.30am! Sorry to have missed you last week, guess you were sitting front left when we were sitting centre right! thanks for giving us the blow by blow on how he constructed this arrangement. Very interesting! Look forward to reading all the upcoming posts.